User Agents are one method of user authentication, in which an agent is installed on each device to transparently communicate user information with the Web Filter to deliver appropriate policies. User resolution supplies the Web Filter with the user credentials in order to provide the end user with the proper policy assignment and reporting. Learn more about other types of user resolution here. When Should you use User Agents? The User Agent is often the most accurate (especially in environments where a single device might have multiple IPs) and the most seamless for the user (avoiding the need for web authentication) method of user resolution. 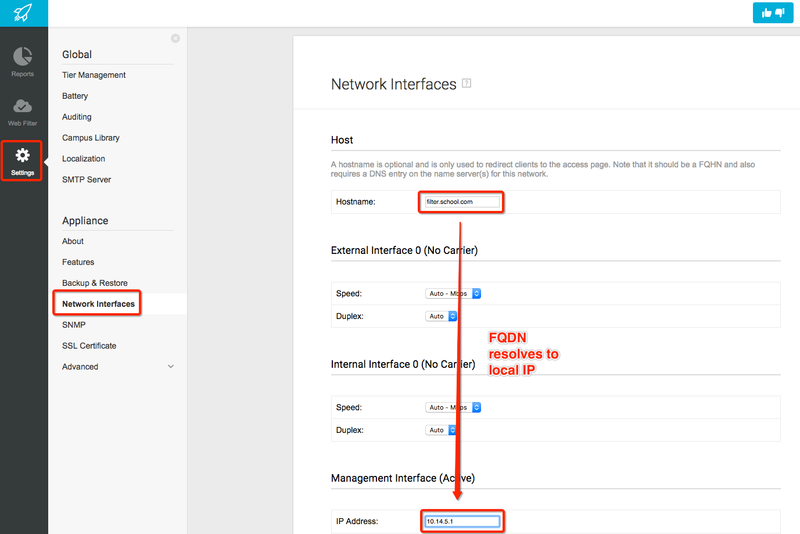 Agent-less user resolution can inaccurately report tracking when a device has multiple or changing IPs (the Rocket only knows the IP that was in use when the user logged in). The one downside to clientside agents is that they need to be installed on every machine; however, we have solutions to streamline that installation. Agents interact with the server using a special TCP protocol that runs on port 1306. Naturally, this port needs to be accessible through firewalls and any other devices that might be in between the agents and the server. Reports are sent to the server over this protocol to keep it up to date and accurately reflect who is logged on to each IP address. User agents are available for the following. Click on each category to learn more about that particular user agent and specific installation procedures. You can access User Agent downloads here. You can learn more about User Agent software requirements here. This software, with versions for Macs, and Linux, provides complete user/machine name reporting to the Rocket appliance. Looking for other downloads? Click here. When mass deploying the User Agent via Active Directory’s Group Policy Object (GPO) or Novell’s ZENworks, a transform (MST) file is needed. This file will preset the update server for each agent. Without it any form of mass deployment would be pointless as the Agents would not report anywhere, and would require a manual registry change on each machine. Download the latest UserAgent MSI and MsiTransform.exe from the download links above. The output file will be within into the current directory that the utility was executed from and will be named “UserAgentIDServer.mst”. Use this file to build the AD-GPO or the ZENworks distribution process for installing the TTC User Identification Agent on your network. Verify that you are running OS X 10 or higher. Note: In a multi Rocket environment the user agents should point to the parent server. The steps for local and remote installations are listed below. Please note the following bindings are supported. Ensure you’ve followed the Mac User Agent Install article before proceeding. Please note admin access is required for installation on the client workstations and a reboot will be required at the end of the installer routine. 2. From your Mac workstation open and mount the UserAgent.dmg file. 3. Run the Lightspeed Systems UserAgent.pkg file to start the installer and click Continue on the warning. 4. On the Introduction page click Continue. 5. On the Installation Type page click Install to proceed with the installation. Please note you will be prompted to enter the admin password in order to install. The Mac User Agent version 4.x installer writes to the file /private/var/log/system.log with ‘useragent’ before each line. You can use this file to help you understand installation issues or to help Lightspeed Systems Support help you in solving any installation issues. Inside the install .dmg is the .pkg file needed to deploy to clients via Apple Remote Desktop (ARD) or another remote desktop application. You can use the free Packages application or Apple’s built-in pkgbuild and productbuild utilities to create .pkg files. 2. Deploy the User Agent package using Apple Remote Desktop or another remote desktop application. Refer to the documentation for your deployment tool on how to remotely install the agent. Please note once the User Agent is installed, you will need to configure the Identification Server. Be sure to replace the IP address below with the IP address or the FQDN of your Rocket appliance. Also please note the command requires admin access. Clients running older versions of Mac OSX will have to use Web Authentication, RADIUS or other authentication method that does not rely on an agent. After installing the User Agent for Mac OS, use the deployed useragent.plist file to configure the Identification Server. Important: Save this .plist file to a network location that is accessible by other computers, and if needed, use a program like Xcode to edit the file. Navigate to the location where the useragent.plist is saved. Open a Terminal window then enter this command (and admin password): sudo defaults import useragent useragent.plist. This command applies the .plist file’s settings to the local User Agent. Note: Use the same command (above) if you’re creating and running a script to configure User Agents on additional computers.. The Mac User Agent can be installed directly over top of an existing version, no different than if it were a brand new install. Thus please follow Mac User Agent Install for new installs and upgrades. The Mac User Agent installer writes to the file /private/var/log/system.log with ‘useragent’ before each line. You can use this file to help you understand installation issues or to help Lightspeed Systems Support help you in solving any installation issues. 1. From your Mac workstation open and mount the LightspeedUserAgent.dmg file. 2. Run the uninstall file to start the uninstall process. 3. You will be prompted for the ‘admin’ password before uninstall commences. If you are using Web Filter 3.2, 2.x, or anything lower than 3.2.1 then you should continue to use the Windows User Agent for identification. In addition, if you are running Windows XP or lower, you MUST use the Windows User Agent. If you want to allow the installer to specify an ‘Update Source’ for the User Agent, as part of an automated or remote install you can use our MsiTransform.exe tool. Learn how to install here. In order to ensure the User Agent Service is always running and to help facilitate error recording in the event of a service crash please set the User Agent Service recovery options to “Restart the Service” as shown below. This behavior can be set with a Group Policy Object (GPO) to avoid manually editing the preferences on each workstation. See the Microsoft Windows Server help page “Configure a Service Item” for information about configuring a GPO. Note: In a multi-Rocket environment the User Agents should point to the parent server. Do you want to install the Windows User Agent as part of a base image? 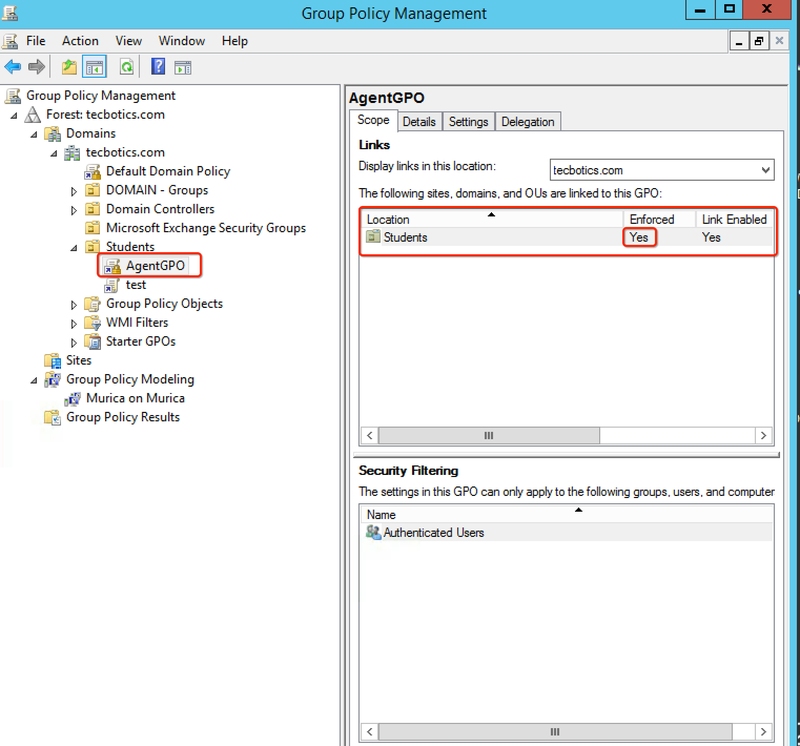 You can use Group Policy Objects (GPOs) to assign and install software to computers in a domain, and it can be useful to deploy this software based on group membership or OUs. This section describes how to have your User Agent software deployed across multiple OUs. Tip:For more information on the basics of assigning software to specific groups by using a GPO, refer to Microsoft Knowledge Base article 302430. 1. 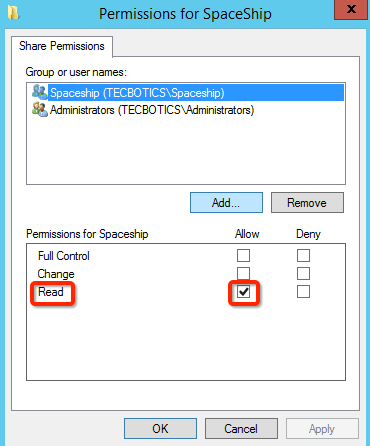 Create a network share folder to hold the deployment MSI and MST files. Set the security on this folder to allow AD users and computers (“Everyone” group) to have ‘read and execute’ privileges. Build, copy or move the required MSI and MST files into this location. 2. 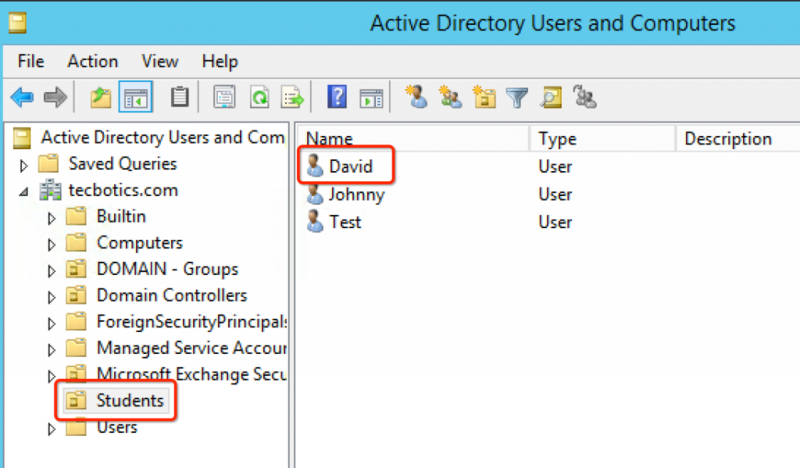 Log into your network’s Active Directory server as a domain administrator, and then launch the Active Directory Users and Computers snap-in. 3. Though you can apply group policies to an entire domain and multiple OU’s, it is highly recommended, that when planning the installation of the User Agent software that you apply the group policy to ONLY the lowest common workstation OU, not at a Domain level. 4. From the Active Directory ‘Users and Computers’ snap-in, locate the OU that you want to have the GPO linked to. Right-click that OU, click Properties, and then click on the Group Policy tab. 5. Click the New button to create a new GPO for installing the User Agent MSI package. Enter a descriptive name for this new Group Policy, such as “Deployment of User Agent” and click Enter. 6. Select the new GPO name that you just created and click Edit. This starts the Group Policy Editor. 7. Expand the Software node of the Computer Configuration set, then right-click ‘Software Installation’. Select the ‘New -> Package’ option to open the browse dialog for selecting the User Agent MSI. 8. Navigate to the network location that contains the User Agent installer files. Click on the ‘User Agent(x86 or x64).msi’ file, and then click Open. If the installer files reside on a local hard drive, do not use a local path provided by the browser – instead, use a UNC path (such as servernamesharenamepathfilename.msi) for the local PC to universally indicate the location of the installation files. 9. If you allow the Group Policy to be created with the file location specified as ‘local’, client computers that attempt to install the package will look in their LOCAL hard drive folders, and will not find the installation files and the installation will fail. 10. In the Deploy Software options dialog, click and select the Advanced option, which will allow you to specify modifications (MST files) for the software installation then click Enter to move to the installation properties dialog. 11. Click on the Deployment tab and make sure that the ‘Uninstall this application when it falls out of the scope of management’ option is NOT ENABLED. 12. Click on the Modifications tab, then click the Add button to browse for the associated MST file. This file should have been labeled “UserAgentServerID.mst” and should be in the common file share where the “User Agent(x86 or x64).msi” file is located. Select this file and click the Open button to add it to the modifications list. Click the OK button when all properties are complete. This will save and assign the GPO to the selected OU. Click on the Software Installation node to refresh and display the completed/assigned policy. 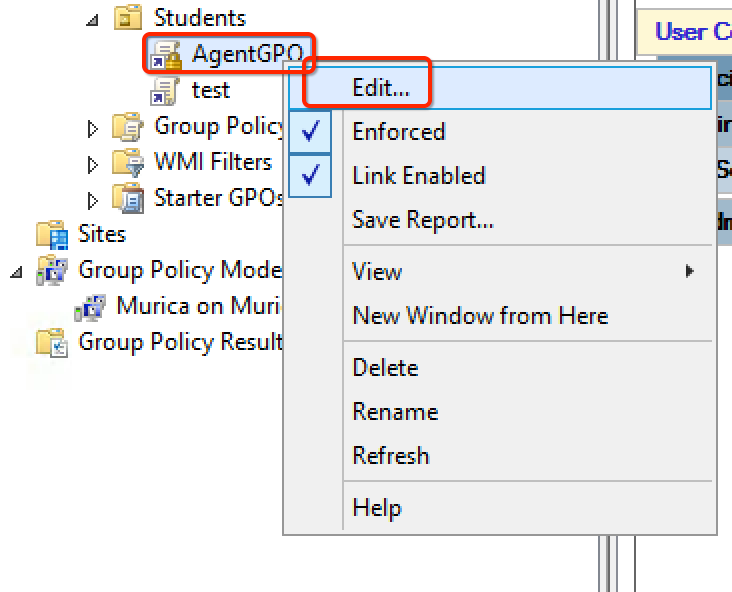 Note: Changes to a GPO are not immediately imposed upon the target computers, but are applied in accordance with the currently valid group-policy refresh interval. This gpupdate command with the /force flag should be effective on any currently supported Windows OS. Do you want to install the Windows User Agent with Zenworks? Do you want to install the Windows User Agent Manually? The PC User Agent can be installed directly overtop an existing version, no different than if it were a brand new install. Follow either of the processes below to remove the User Agent. Click Yes to complete the uninstall. Requires the UserAgent(x86 or x64).msi to be in the same directory. The User Agent supports native OpenLDAP user resolution. Using the WinLDAP implementation, an LDAP server is communicated with and queried to obtain the base search path, the user’s DN and the user’s groups. Note: Unlike AD and Novell environments, an OpenLDAP environment requires UA registry configuration. You should push the Lightspeed User Agent for Chrome via the G-Suite Admin Console. When both are true, this User Agent extension transparently authenticates users within your tier address space to your tier’s Google Authentication source. Please note users must be valid members of your Google Auth domain. Note: The Chrome Extension User Agent requires a Web Filter license from Lightspeed Systems. Devices with multiple interfaces and/or IPv6 and IPv4 enabled will be authenticated using only the IP address that hits the Rocket API. The other addresses will still be considered unknown. The Linux User Agent allows user resolution for many flavors of Linux. A current list is available on the Downloads page. Upon installation and configuration, the User Agent will send the user login name, IP address, and host name of the machine to the defined Identification Server. This information will then display in Web Filter reports. Install the “dialog” package for your system. SuSE comes with it, Ubuntu and Fedora Core don’t. This will allow you to run the menu-based configuration tool as a full-screen console. 1. Double click the downloaded file and let your package manager install it. 2. Options and menu screen may vary depending on Linux distribution. 3. After installation is complete, open a terminal window. 4. Gain root privileges either through sudo su or just su. In most cases, the preselected services will work best. To uninstall the Linux User Agent, with root permissions at a terminal, select and run the executable appropriate for your Linux distribution. Terminal Services, nComputing or Citrix servers – With thin clients, there is no way to differentiate at the domain controller level the identity of the user performing the web browsing functionality on the server. Because of this, the last person that logs into the server is registered as the person for all users on that system. So, if you use these types of servers, the domain controller agent by itself is not an effective solution for your network. Dual Internet connection devices – When laptops switch between wired and wireless access, the user is not required to log in again, so the Domain Controller agent would not know who you are at this point and it will not be effective as a solution. Mobility devices – When a device goes off-campus and back on, the network is re-logging the device into its previous session, so the domain controller is not notified that the user is on the device with that particular IP address. BYOD – If you are supporting the option for users to bring their own devices on the network, then these devices are not members of the directory network; therefore, the user never logs into the domain itself. The Active Directory Domain Controller Agent ( DCUA ) can be installed on Microsoft Active Directory Domain Controllers to supply the Rocket Web Filter with user information when a user logs into the network. Agents are available for download here. In order for the Domain Controller User Agent (DCUA) to be able to “see” logons and logoffs, the security policy for the domain must be configured to audit those events. 2. Expand the Domains folder under the Forest to be configured. 3. 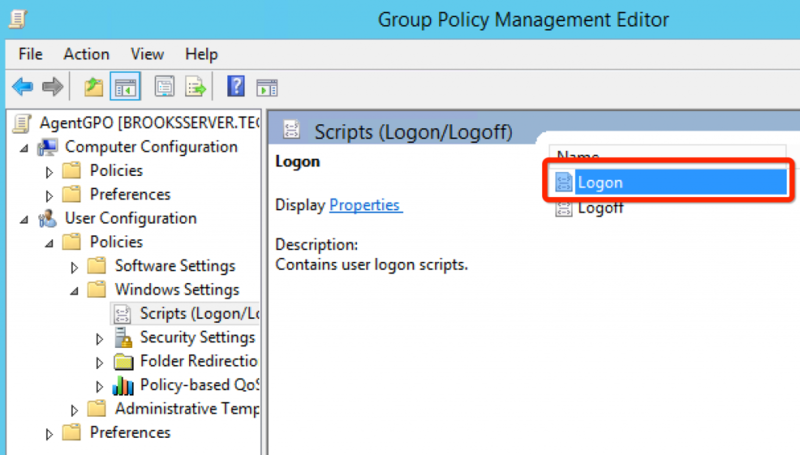 Expand the Group Policy Objects folder under the domain to be configured. 7. Check the Success box and click OK.
9. Check the Success box and click OK.
4. Check the Success box and then click OK.
6. Check the Success box and then click OK. The Domain Controller User Agent is installed using a Windows installer MSI package file. See the User Agents Agents and Downloads page to download this installation file. msiexec /i DCUserAgent.msi /l*v <log path> SERVER="<server name>"
<server name> is the name of the Lightspeed Systems Rocket server that logons and logoffs will be reported to. The log path switch (/l*v) and path are optional. If installation occurs without the use of the SERVER parameter the Identification Server registry key will need to be update with the Lightspeed Rocket Server IP address providing this service. Logging of DCUA events must be set through the Windows Services management console. The LMA Agent gives you the power to control certain device features that would be otherwise un-controllable. Note: Starting with Web Filter 3.x, the LMA Agent replaces the PC User Agent as your all-purpose method of user resolution. Customers who are upgrading to or using Rocket Web Filter 3.2 need to use the Lightspeed Management Agent (LMA) as their PC user agent. Note: Customers who have previously installed the Windows User Agent must first uninstall the Windows User Agent before installing the LMA. You should also make sure any methods you used for installing the User Agent are disabled. 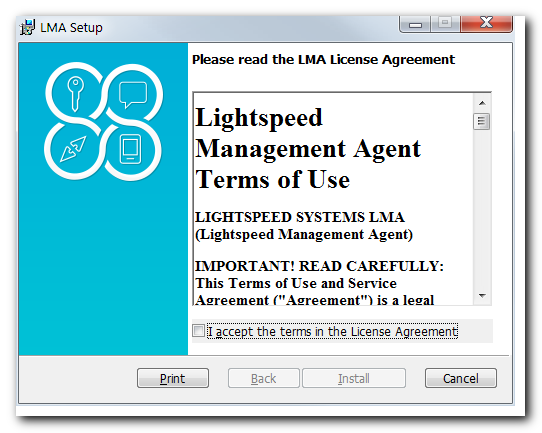 Customers who only require the LMA agent and want to add in the Rocket identification server during installation can use the following switch to install the LMA agent on their devices without bounding it to other Lightspeed products, such as Mobile Manager. Learn how to install the LMA from .bat over GPO here. Current Lightspeed Systems Customer Account – You will need to provide it during installation if you are installing Classroom Orchestrator, Mobile Manager, or both. Mobile Manager Enrollment Code for Mobile Manager Installation – You will need to provide it during installation only if you are installing Mobile Manager. If you are only installing Classroom Orchestrator then you do not need it. The enrollment code can be found by clicking Enroll Device under your organization in Mobile Manager. The LMA Client PC Setup File – LMA_Setupx64.msi or LMA_Setupx86.msi, which can be downloaded at the above links. .NET Framework – Your .NET Framework needs to be at version 4.5.2 or later. You can update your .NET Framework here. Note: The LMA is only required for clients with Web Filter 3.x who have users running Windows devices. 1. Log into the client PC. 2. Download the LMA_Setupx64.msi or LMA_Setupx86.msi file onto the PC. 4. At the command prompt enter LMA_Setup.msi CUSTOMER_ID= followed by your Lightspeed Systems customer number. You also need to provide an enrollment code if you are installing Mobile Manager (ENROLLMENT_CODE= followed by your Mobile Manager enrollment code), an optional associate user setting (ASSOCIATE_USER=1), and the portions of the product you would like to install (entering MM=1 enables the Mobile Manager service. And the example below installs Mobile Manager only. MM: Indicates that you are installing the Mobile Manager. If present, it must be set to 1. Omit this parameter if you don’t want to enable Mobile Manager. CO: Indicates that you are installing the Classroom Orchestrator. If present, must be set to 1. Omit this parameter if you don’t want to enable Classroom Orchestrator. Note: You must provide at least one of the above values (CO or MM), or both. CUSTOMER_ID: Your organization’s customer number as assigned by Lightspeed Systems. This is a required value. 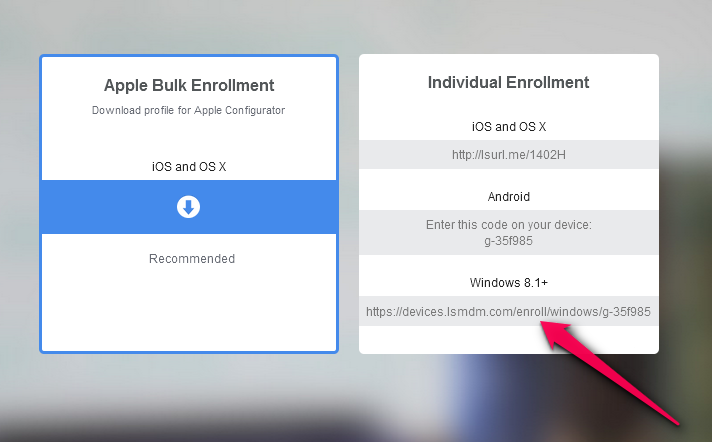 ENROLLMENT_CODE: The enrollment code for installing Mobile Manager, which can be found by clicking Enroll Device under your organization in Mobile Manager. ASSOCIATE_USER: Optional. Set to 1 to enable this. Please note the ASSOCIATE_USER parameter can be set to 1 (true) or 0 (false). If true, it will bind that device to a particular user in Mobile Manager. This way you can apply policies to a user that will propagate to various devices. Note: You will not be able to proceed without your customer number, enrollment code, associate user, and Mobile Manager. Once the installation process starts the following license prompt will be displayed. 5. Check (select) I accept the terms in the License Agreement. 6. Click Install. The installation status will be displayed as shown below. 7. Click Finish to complete the installation process. You can also use the Device Registration Portal to manage devices. This can be used with the Windows Mobile Filter. Do you want to learn more about the Device Registration Portal? To install the LMA using Mobile Manager, you will need to use the an MSI converter to change the MSI file a .lsmdm file. You can learn how to install MSI files on enrolled Windows 10 devices through Mobile Manager here. When installing the LMA, you can now skip adding the switches for Customer_ID, Mobile Manager (MM), and Classroom Orchestrator (CO), as long as your Domain, Public IP Range, or MAC address of the device is entered in the Device. You can also install the LMA via GPO and via Boot Script. 1. Commonly, the LMA is installed without any parameters mistakenly and the result is no identification. If this happens, it is relatively easy to correct the installation. The information is stored in the registry under HKLM/Software/Lightspeed Systems/LMA/User Agent. Check that the Identification Server key is set properly. 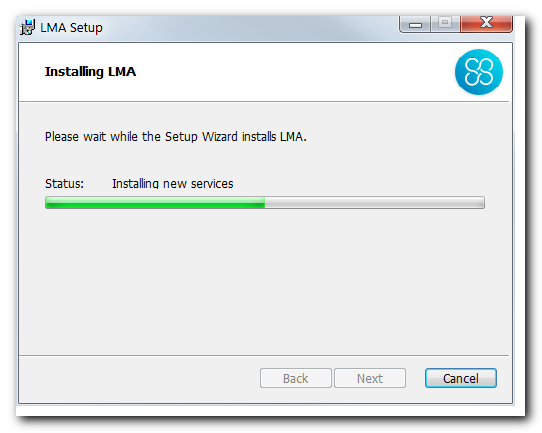 If not you can change it here and restart LMA_Service with the net stop and net start commands. 2. If the installation appears to have been successful, but you are still not seeing identification information on the Rocket and/or getting the wrong filtering Rule Set, check that the ID server is correct and reachable. Check the setting in the registry and try to ping that name or IP from a terminal window. If it responds then basic communication is possible. 3. If you are able to ping your Rocket, the next thing to check is to see if the proper ports are open between the workstation and the Rocket. This is a common problem on restricted VLANS that some administrators use for student device. Check with the person in charge of network security and ask them to check that ports 1305 and 1306 TCP and UDP are open. 4. Lastly, check the lsidentd service on the Master/Parent Rocket. If this service is not running, then agents will not work properly. Upgrades and uninstallation of the LMA now require a customer to have their organization registered with Device Registration Portal. During installation, an LMA will register with DRP, where it will then be attributed with an uninstallation password. There is the option to choose auto updating the LMA when a new version becomes available. Additionally, through DRP a customer is also able to enable/disable the MM and CO functionality of the LMA. The settings from the previous installation will be saved. Settings from the previous install will be maintained. Note: Imaged Agent Install Settings in the Device Registration Portal can affect the registry of devices where the LMA is installed. Learn more here. Uninstalls require Internet access to api.lsfilter.com and a corresponding uninstall password. This is required for the built-in safeguard to prevent unauthorized persons from uninstalling the software. In addition, devices must have their MAC address registered to mobile.lsfilter.com. This is so that we can tie them to an organization to verify the password. Note: You can find the uninstall password within the Device Registration Portal. 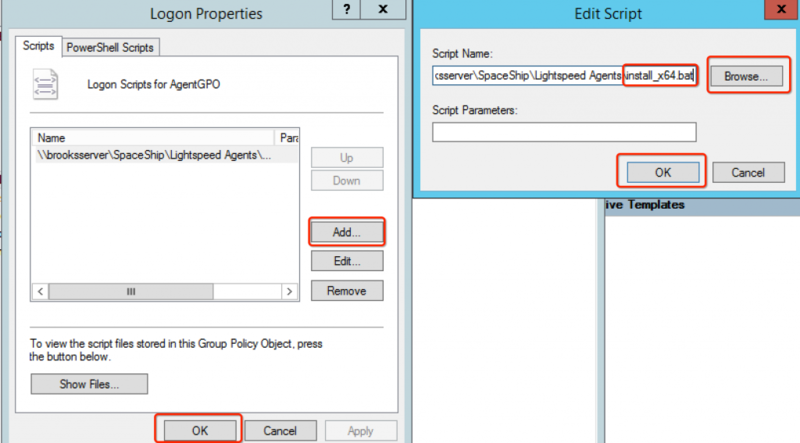 These instructions illustrate how to install the Lightspeed Management Agent from .bat over GPO as user agent for user resolution. All customers who have Rocket 3.x or higher need to use the LMA agent as their PC user resolution method. 1. Download the required agents. Note: Follow the installation instructions on this page in order to install the LMA over GPO. *Note: %~dp0 ensures the .msi is ran from the network directory the agent is hosted. id_server=Fully Qualified Domain Name resolving to the internal Rocket NIC. Ensure that the hostname resolves to your Rocket’s IP. 3. Create a network directory to hold the LMA agent and .bat script. *Note: Ensure only ‘read’ access is granted to your end-user security groups for this directory. Check out figure 1 for more information. Check out figure 2 for additional details. 4. Create the GPO inside you user OU. c) Title the GPO, right click it and select Enforced. d) All user accounts the GPO should apply towards will be in this OU. Figure 2 is how the Group Policy Management should look. Figure 3 displays the user accounts from AD Users and Computers pertaining to this tutorial. *Note: For this scenario, we are testing on the Student OU using the “David” account. 5. Configuring the GPO to run a login script. c) Click the Add button and navigate to the .bat script you created earlier. Select the .bat script and select OK and then OK again. *Note: Ensure the .bat is being pushed out from a network directory. 1. On a test machine, login on the machine. Upon login, the script will run silently installing the user agent. Check the install directory and the registry to validate installation. 2. Validate that the install files and ID Server value are both present. 4. 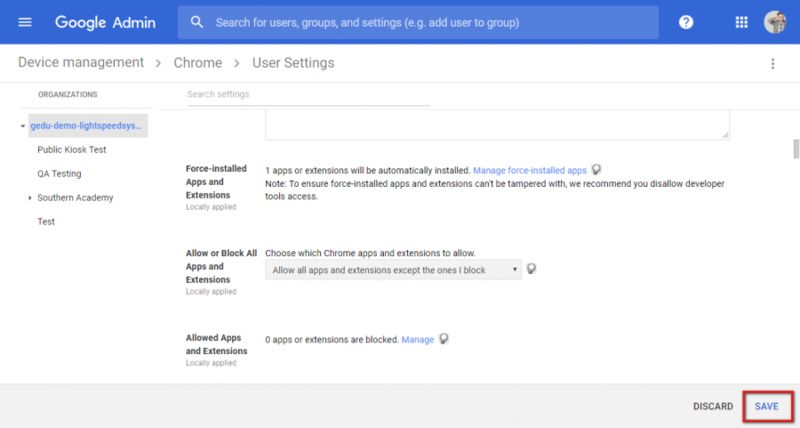 Scroll down to Apps and Extensions and click Manage force-installed apps. 5. Under Chrome Web Store, download the extensions you need. Click Add to add each extension. Click Save after you’ve added all your necessary extensions. Note: Certain extensions, such as the Chrome User Agent and the Lightspeed Chrome Mobile Filter need to be pushed manually instead of through the Chrome Web Store. Once you push the Lightspeed user agent extensions to your devices, these devices will auto-populate in your Chrome Bundle. 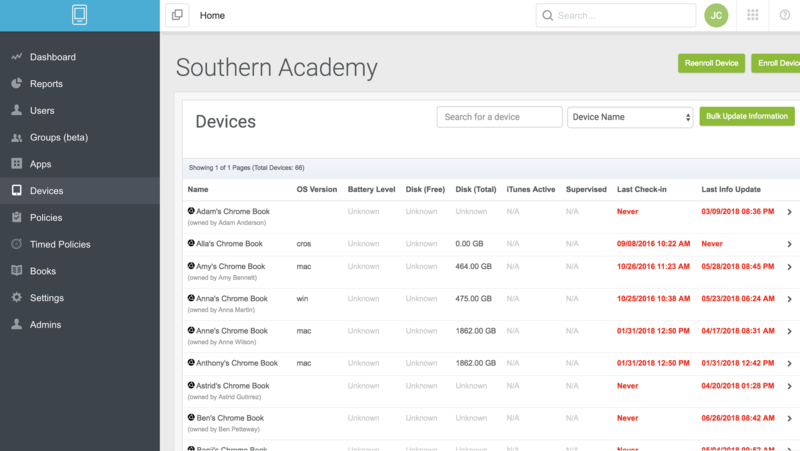 You can view a list of your devices in the Mobile Manager Devices tab. Note: Customers who currently use SSL certificates generated by a Certificate Authority (CA) with their Rocket appliance MUST push the new Chrome Lightspeed S-Mobile Filter and not the Lightspeed Mobile Filter to devices. Learn more here. Note: Customers who have devices other than Chromebooks (Windows or iOS devices) will need to install those specific user agents on their devices. Learn more about Windows and iOS user agents. The recent release of Rocket 3 has many of our users asking if they can still use their old user agents. While most of the user agents will still work, any customer running version 3 of the Rocket needs to upgrade to the LMA (Lightspeed Management Agent) User Agent for Windows for their user resolution purposes. Lightspeed Systems will no longer support the PC User Agent for Windows devices connected to a Rocket 3 interface. You can download the latest LMA User Agent here. The Windows LMA User Agent uses a new secure protocol to communicate with the Rocket. In the new protocol all data between the client machine and the Rocket appliance is encrypted. This makes the LMA User Agent safer and more effective than previous versions. How About Customer With Rocket 2.x? Customers with Rocket 2.x should run the PC User Agent for Windows user resolution. You can find the PC User Agent, as well as other user agents, here.